I love looking at all the fancy wrapping paper in the store. And without fail, I get some serious sticker shock when I look at how much it sells for. I’m just a little too frugal at heart to spend that much on something that will just be ripped up. Here’s what we do instead at our house when it comes to wrapping presents. This works well for Christmas, but you can use the same tips and ideas for presents throughout the year. Let’s start with the tip that won’t cost you a penny. I learned this from my mother. Each Christmas (and birthday… and any other occasion when we would receive a wrapped gift), she would remind us to open the gift carefully lifting the tape from the paper. This way the wrapping paper could easily be reused. She’d cut off any badly torn pieces and if it was very rumpled, she’d go as far as ironing the paper. I also got in the habit of saving and reusing any gift bags I get. Bows and ribbons can also easily be stored for next year’s gift giving. All it takes is a little careful opening and remembering to store the wrapping supplies for the next occasion. It is well worth it when you have a last minute gift to wrap and can head to your $0 gift wrapping supply stock. We do a lot of shopping online and I often find both butcher paper and plain tissue paper inside used as packing material. I save the paper and use it to wrap presents throughout the year. Even plain brown paper can be dressed up to look pretty with some bows, ribbon, etc. More on that later. I also like to save newspapers and magazines to wrap gifts in. My nieces and nephews now look forward to getting gifts wrapped in the Sunday Funny pages. Magazine pages can be taped together to make pretty, glossy thick wrapping paper. If you start out with plain wrapping paper (be it a solid color one, news paper, or the butcher paper used in the image below, it’s nice to dress things up a little bit with some pretty yarn, string, twine and then add some little ribbons, bows, or even some pine needles. Look around the house and see what you have laying around. I’m sure you’ll come across some ribbons or maybe some baking twine. As a knitter and spinner, I always have leftover yarn sitting around. I often use some in Christmas colors to wrap up presents. Next, head outside. Can you find some pretty leaves or some pine needles? How about a little cutting off your holly tree? Tuck them in the string or ribbon you tied the present up or stick it to the wrapping paper with a bit of clear tape or glue. If you’re down south, keep an eye out for Magnolia trees. Their leaves should still be bright green and make beautiful decorations. Last but not least let’s talk about making the wrapping part of the gift. Last year I got my husband a graphic T-shirt as part of his Christmas present. I used the shirt and some ribbon to wrap one of his other presents. If you’re making food gifts, the mason jar you put them in can be your wrapping. Tie a bow around it and you’re done. I have a friend who loves tea. I get her a fancy bag of tea and wrap it in a pretty tea towel and tie it up with baking twine. It looks beautiful and she can use the “wrapping paper” in her kitchen all year long. 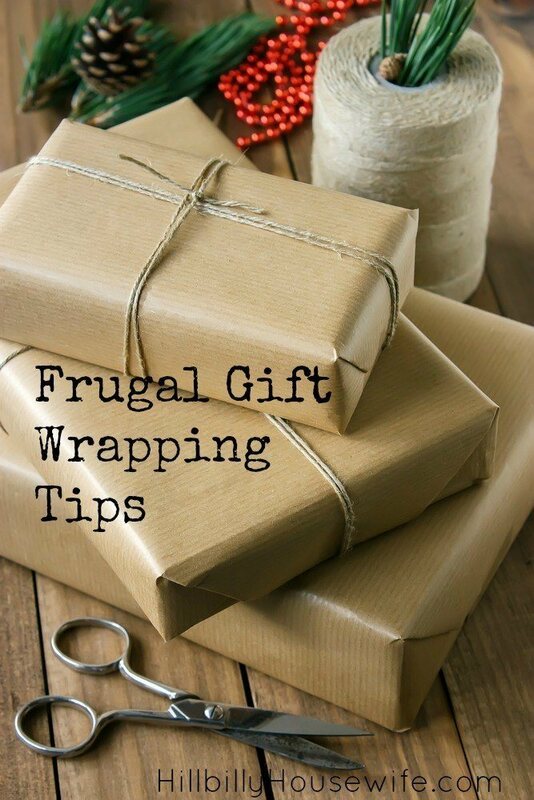 Do you have some frugal wrapping tips to share?